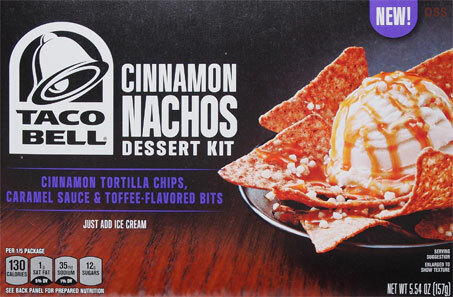 [New for 2013, short lived] Today, October 14th, is National Dessert Day, and ever since we recorded episode 11 of the Nosh Show, I've been searching high and low for these new Taco Bell dessert kits. Between my love of all things cinnamon and my fascination with chocolate choco tacos, I had nothing but high hopes for these treats. Ok, technically I knew my hopes were probably unrealistic even before reading all the so-so reviews, but hey, you have to hope for a winner anyway right? Shocking! The tacos came pre-broken. The outer most two are destroyed, the middle two are salvageable, and then inner two are just fine (and will be saved for my second scoop). It's funny because I see chocolate, but I smell regular tacos... yup, I kind of taste regular tacos too. Definitely no chocolate waffle cone magic here, bummer. You thought I was going to break the shell didn't you? Well.... so did I! I let the ice cream soften though, and then I laid it in as slices more than scoops really. As I got more confident, I started compacting the ice cream and stuffing the shells to make sure I got enough ice cream inside. Why yes, that is two kinds of ice cream inside. We've got mint ice cream on the right side and vanilla on the left (I couldn't pick which flavor I wanted, so I tried both). 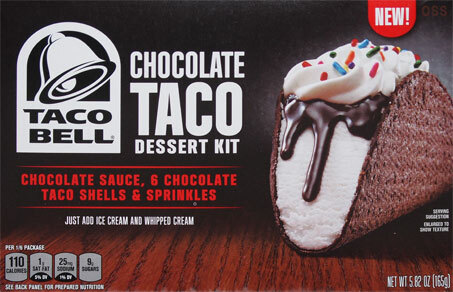 Oh, I've already tasted the hot fudge, it's decent... and it's also running off the taco and into the bowl. So did we like them? Yes and no. 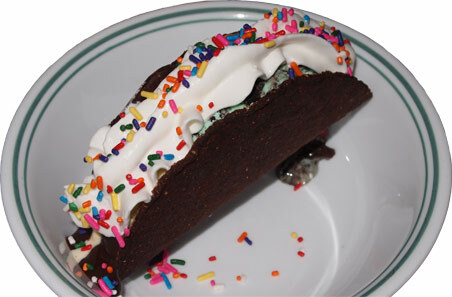 There is a certain creative high from being able to make your own choco tacos... but then the reality sets in and the taco crumbles into a melting pile of go in your once clean hand. 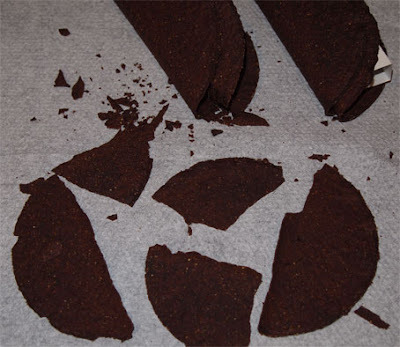 Can you imagine a stronger taco shell that tasted like Oreo? Yeah, well, that's not here. A klondike choco taco adds that classic chocolate coated waffle cone taste and crunch to the ice cream inside. This shell just adds a false sense of security to the mess hiding inside. To make it worse, there's also that weird lingering cocoa corn aftertaste. I was not a fan, but at least I tried. Much like the choco tacos, and despite being flavored, deep down these are still just regular corn chips. They're not bad to munch on, but they're not in my wheelhouse of crazy super cinnamon sugar awesomeness. 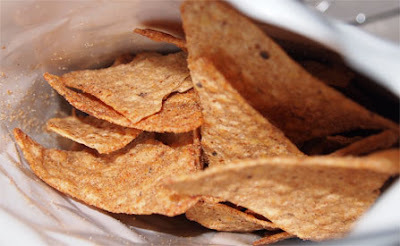 It's hard to be impressed when I can just pick up a bag of much tastier Stacy's cinnamon pita chips. 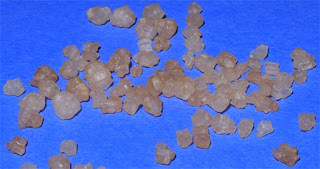 Blue construction paper may have been the wrong choice here... but technically it does show that these appear to be some kind of large sugar crystals with a bit off toffee flavoring sprinkled on them. They smell very potent, and flavoring is... weird... trying to eat them like pez to analyze the flavor... actually, there ya go, toffee flavored pez. Tada! I'll admit it looks pretty cool, but 5 servings it is not. Granted this is maybe 75% of the chips (since I was sampling them and saved a few for later), but there's no way this would tide over 5 people. I split this with my daughter and even after adding a bit more ice cream, we were both still starved afterwards. My favorite part is the very sweet and uncomplicated caramel sauce. 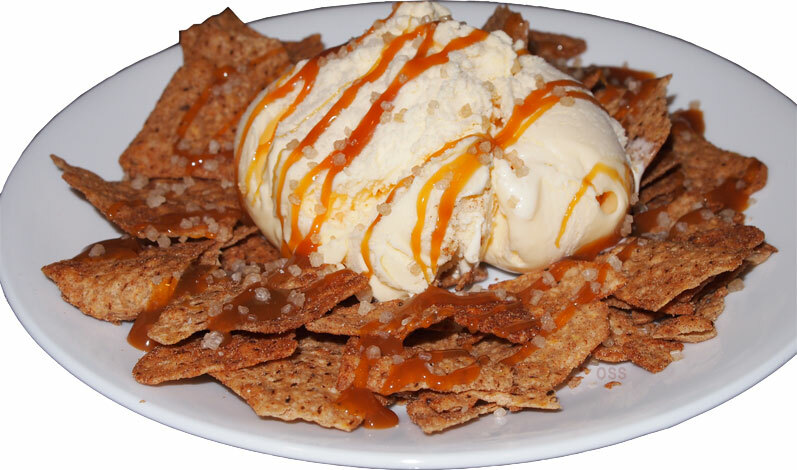 I didnt want notes of this or that, I just wanted my sugar rush and something gooey to cover up the dry chips. Overall, I will admit the flavor is decent and made for a unique afternoon snack, but like the tacos, the chips break way too easily, even in softened ice cream. It's a mess, plain and simple.